I am tired…but it is a good kind of tired. A “day lived well” kind of tired. My family of four enjoyed a peaceful, quiet morning while our seven house guests were out either shopping or visiting with friends. I got some cleaning done. Went running. Did some laundry. And made apple pie with my sweet daughter. While we baked, music played in the background. I was relaxed. Happy. Unconcerned with messes. Which was good, because Anna Grace got flour everywhere. Usually, I would have said, “Oh, Anna! 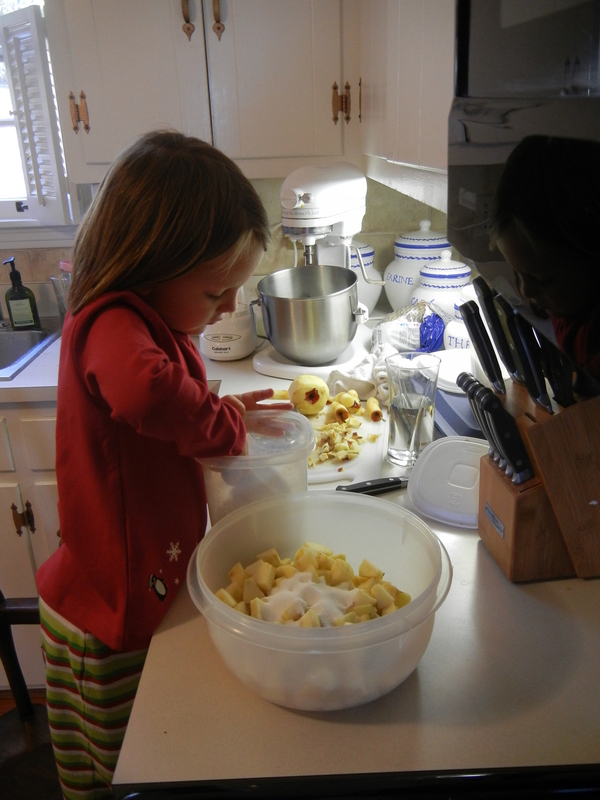 Be careful!” Today, I just laughed, and let her play in the flour on the counter while I finished the pie. It was a peaceful time, a peace that soon gave way to joy as our house started to fill back up with relatives. Our quiet was replaced with laughter, with hustle and bustle, and with happy conversations. As the afternoon passed by, someone suggested going for a walk, and soon everyone else decided to go, too. But I had a pumpkin pie in the oven, so I stayed behind. And the love and joy was replaced with peace again. While I waited for my pie to finish, I sat out on our back patio, just drinking in the silence. I quieted my soul and looked at God’s creation, at the intricacy of the bare tree branches, at the clouds spread across the blue sky, at the occasional burst of birds, darting through the air. They seemed like they were in a hurry. I was glad I had no place to go. I let the solitude fill my soul, and then I went to take out the pumpkin pie. 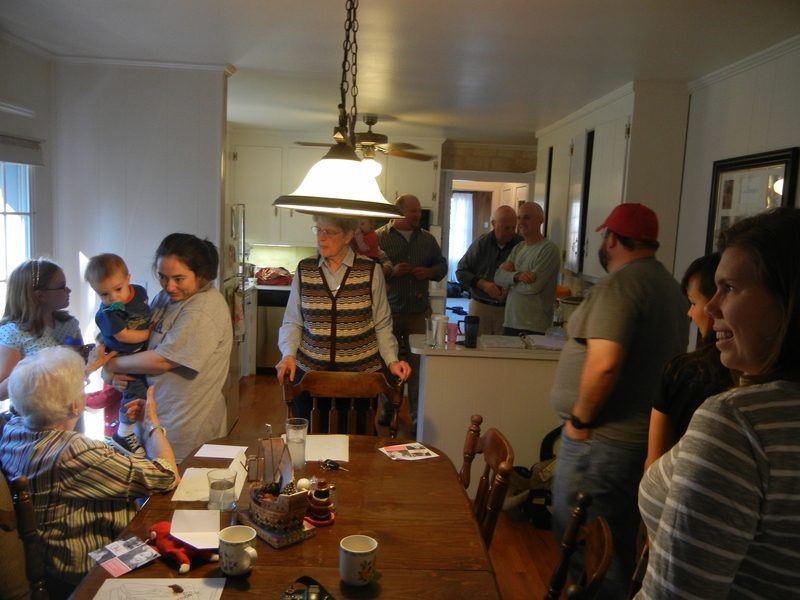 Later, as people filtered back into the house, I thought about the dominant themes of the day: love, joy, peace. Such is the state of the kingdom of God. Today, I experienced the divine during such mundane tasks as food preparation and clean up. I experienced it in the normal interactions of relatives, and in the typical fall weather. I experienced God’s kingdom come in the harmony of a large family who loves each other, in the joy of making pie with my daughter, and in the peace of God’s creation. How was your Black Friday? Did you get out in the craziness, or relax at home? Blumhardt, Christopher Friedrich. “Action in Waiting.” Watch for the Light: Readings for Advent and Christmas. Farmington, PA: Plough Publishing, 2001.
we did a little of both…mom, mary elizabeth and i went out for awhile in the morning, then we watched football all afternoon with alyne and aaron…then firepit later in the evening while we skyped tommy and becky…it was a good day! miss ya’ll!